With the EU & NA Spring splits coming to a close, it's time for another edition of This Week in eSports! Continue reading for the results of the NA/EU LCS finals, info on the upcoming International Wildcard Invitational and Mid-Season Invitational events, and more! As always, let's kick off the wrap up with results from the various regional leagues! The brackets and standings below are up to date as of Sunday, April 19th and as always, VODs can be found here. The Finals stage of the 2015 NA Spring Playoffs concluded this weekend! Team Solomid defeated Cloud 9 with a record of 3 - 1, securing first place in the 2015 NA LCS Spring Split! With this, Team Solomid have secured 90 championship points and a spot at the upcoming Mid-Season Invitational! 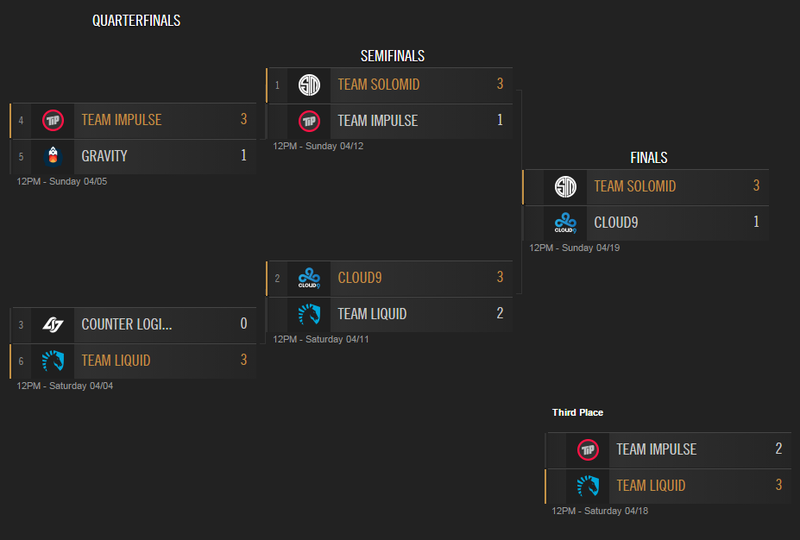 Team Liquid defeated Team Impulse with a record of 3 - 2 securing third place. For a reminder on how the 2015 season's Championship point system works, see this post! The Finals stage of the 2015 EU Spring Playoffs also concluded this weekend. Fnatic defeated UOL with a record of 3 - 2, securing 1st place in the 2015 EU Spring Split! 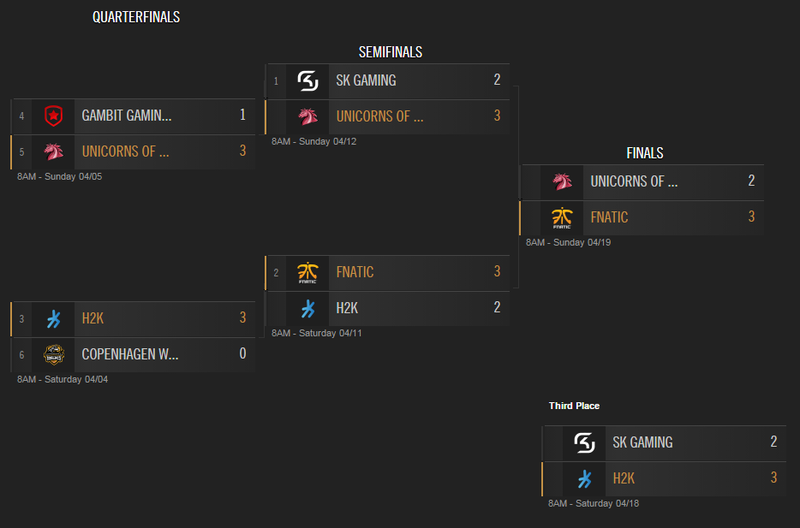 With this, Fnatic have secured 90 championship points and a spot at the upcoming Mid-Season Invitational! H2K defeated SK Gaming with a record of 3 - 2, securing 3rd place. The 2015 Challenger Series spring playoffs have come to an end, but the Summer Promotion Tournament starts next weekend! Winners of the Summer Promotion tournament will earn a post in their region's LCS summer split. Team Fusion will be playing Team Dignitas on Sunday, April 26th. TDK will be playing Winterfox also on Sunday, April 26th. Reason Gaming will be playing Giants Gaming on Saturday, April 25th. CWA will be playing Roccat also on Saturday, April 25th. The LCK Spring Playoffs continue on April 24th with CJ Entus vs SKT T1 in the second round. As a reminder, the Winner of the finals will go on to the 2015 Mid-Season Invitational in early May. The CBLOL concluded this weekend with INTZ going 3-0 against kStars, securing their spot in the International Wild Card Invitational! With the regional finals all wrapped up, here's a rundown of who is qualified and competing in the upcoming International Wild Card Invitational. The IWCI will kick off on April 21st and run through April 25th from Istanbul, Turkey. Match schedules can be found here or here. The winner of the IWCI will join teams from the other leagues at the Mid-Season Invitational in May. The 2015 Mid-Season Invitational is coming up soon! The event will be held from May 7th-10th in Tallahassee, Florida. 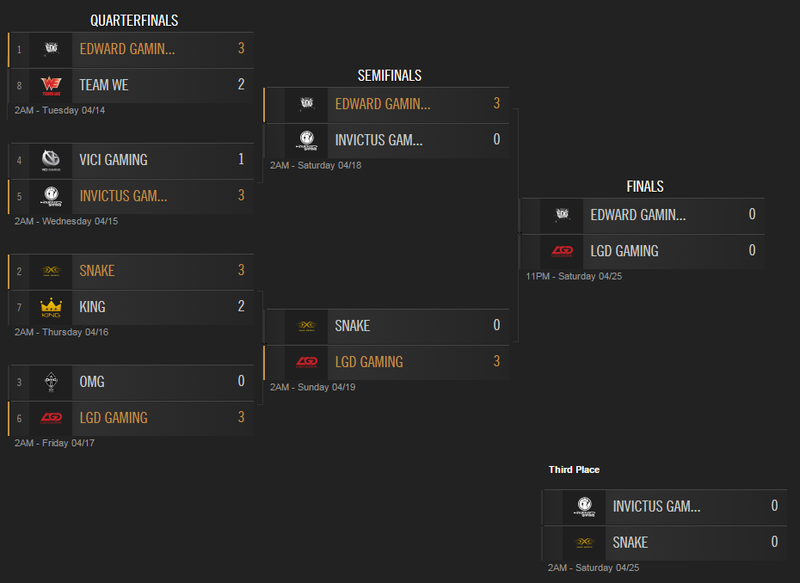 Thus far only THREE teams that have already been qualified for MSI by placing first in their respective regions. The remaining 3 teams that have yet to qualify include South Korea, China, and the International Wild Card Invitational winners. Counter Logic Gaming's coach Scarra parts ways with the team. From the announcement: "As a result of the final standings, as well as personal issues, Scarra has decided that the best course of action for himself and the team would be to resign as its head coach." CLG is currently taking applications for a new coach. Team Fusion, who is competing for a post on the NA LCS at the Summer Promotion Tournament, has added Bubbadub as an analyst. Roccat's coach Ducky parts ways with the team. Jakob "Yamato Cannon" Mebdi has joined the team as his replacement. Riot Chopper also commented on the situation here. MSI will be played on patch 5.7. Coaches will be allowed on stage during picks and bans. Mid-series substitutions will be allowed in the best of series during the tournament. Caster line up is still being decided. Casters / Hosts / Analysts to be revealed in near future! Magus elaborated on the choice of Tallahassee as a location here. Broadcast start times available here. Official Rules for the event will be released shortly. Attendees will have a chance to meet the pros after the show ends. Magus noted for live audience, "We'll have something fun for you guys on the final day". Magus noted they will be taking a look at the results from this year's MSI and examining if the tournament is worth expanding to more spots per region. There will be a limited offering of merch & kiosks with free shipping at the event. RedBeard noted they are aware of the demand for an event in Canada and it is on the "short list of places we know we need to go". RedBeard noted MSI "doesn't classify as Riot's East Coast event that we know we need to deliver to fans"
When asked where the Samsung White championship skins are, they replied with this and this.